Saw this roadrunner relaxing a foot off the Roller Coaster trail. He was alive and well, just resting and putting a little too much trust in his camouflage. Got the snap and left him alone. Foggy and overcast, low 40's to begin but temps rose to the low 60's, partly cloudy and no fog by the time we finished. The trails were damp and sticky in places making us stop a few times to knock the mud off our hiking shoes. Found a pile of eight golf balls behind a agarita shrub along a trail - no idea why the balls were there. 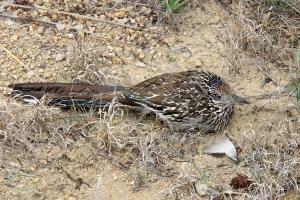 Saw a couple of road runners (photo attached) as well as other birds. One of the resident longhorns had wandered away from the main herd and looked out of place so we called park personnel to retrieve the animal - I assume they did. Not much trash besides the golf balls was found during the hike. The fresh air and exercise plus relaxing with a post-hike cigar and bottle of stout when I got home made this a very good day!